This map is based on OMI measurements acquired between 2005 and 2012. The NO2 signal is most prominent in an Indian Ocean shipping lane between Sri Lanka and Singapore, appearing as a distinct orange line against (lighter) background levels of NO2. Other shipping lanes that run through the Gulf of Aden, the Red Sea and the Mediterranean Sea also show elevated NO2 levels, as do routes from Singapore to points in China. 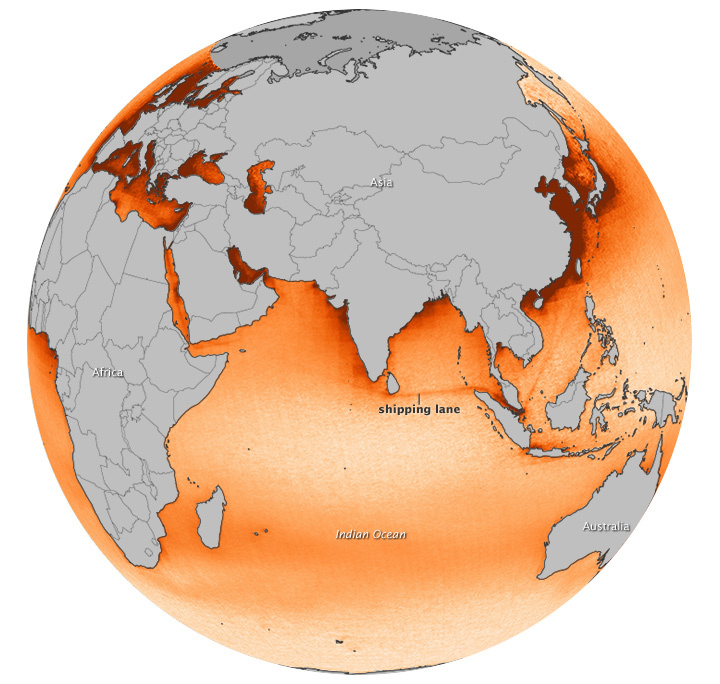 For more than a decade, scientists have observed “ship tracks” in natural-color satellite imagery of the ocean. These bright, linear trails amidst the cloud layers are created by particles and gases from ships. They are a visible manifestation of pollution from ship exhaust, and scientists can now see that ships have a more subtle, almost invisible, signature as well. Data from the Dutch and Finnish-built Ozone Monitoring Instrument (OMI) on NASA’s Aura satellite show long tracks of elevated nitrogen dioxide (NO2) levels along certain shipping routes. NO2, is among a group of highly-reactive oxides of nitrogen, known as NOx, that can lead to the production of fine particles and ozone that damage the human cardiovascular and respiratory systems. Combustion engines, such as those that propel ships and motor vehicles, are a major source of NO2 pollution. The map above is based on OMI measurements acquired between 2005 and 2012. Other shipping lanes that run through the Gulf of Aden, the Red Sea, and the Mediterranean Sea also show elevated NO2 levels, as do routes from Singapore to points in China. These aren’t the only busy shipping lanes in the world, but they are the most apparent because ship traffic is concentrated along narrow, well-established lanes. The Atlantic and Pacific Oceans also have heavy ship traffic, but OMI doesn’t pick up NO2 pollution tracks because the shipping routes are less consistent. The shapes of landmasses force ships into narrow paths in the Indian Ocean, while ships in the Atlantic and Pacific tend to spread out over a broad areas as they navigate around storms. In addition, the air over the northeastern Indian Ocean is relatively pristine. Heavy NO2 pollution (dark red in the map) from cities and off-shore drilling activity along the coasts of China, Europe, and the United States obscures the ship tracks that might otherwise be visible to OMI. In the map, the Arctic is gray because the lack of light during the winter and frequent cloudiness during the summer prevented OMI from collecting usable data in the area. Urban areas and industrialization aren’t the only source of NO2 in the map. Agricultural burning in southern Africa and persistent westerly winds make an elevated band of NO2 that stretches from southern Africa to Australia. Lightning, which produces NOx, also contributes to background NO2 levels. Just how much shipping contributes to overall NOx emissions remains an open question for scientists. Research suggests that shipping accounts for 15 to 30 percent of global NOx emissions; scientists are using satellite observations to reduce the uncertainty in such estimates. OMI is not the only satellite instrument observing NO2 levels in the atmosphere. The Global Ozone Monitoring Experiment (GOME) instruments on the European Space Agency’s ERS-2 and MetOp-A satellites, as well as the SCIAMACHY instrument on the Envisat satellite, have made similar measurements. In 2012, Dutch scientists published a study combining data from all four instruments to show that the NO2 signal over major shipping increased steadily between 2003 and 2008, then dropped sharply due to the global recession and reduction in ship traffic. 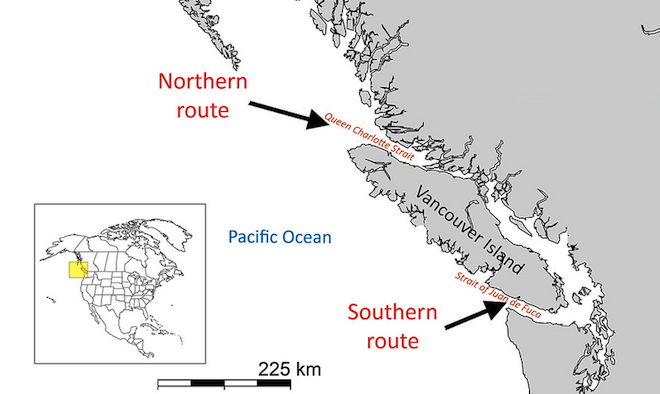 After years at sea, sockeye salmon returning to their freshwater homes may be guided by an early memory of the Earth’s magnetic field, encoded at the site where natal streams empty into the Pacific Ocean, according to a study published today in Current Biology. “Lots of folks have been wondering for decades how salmon and other animals, like sea turtles or seals and whales, go out in the ocean for a couple of years and then return with remarkable accuracy back to their home,” said study coauthor Nathan Putman, a marine biologist at Oregon State University. 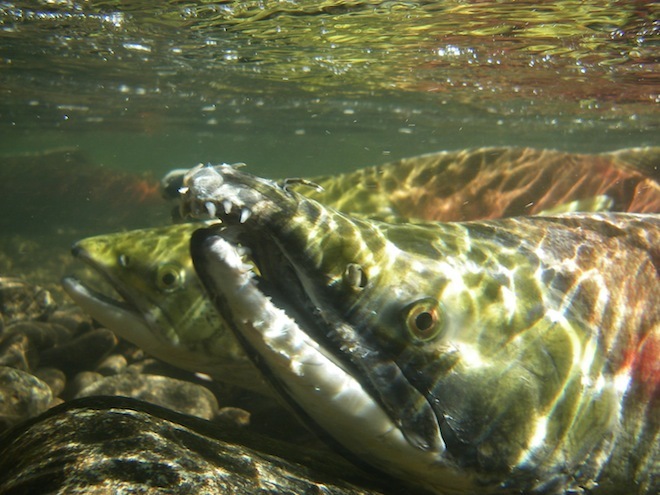 “The magnetic field is an important part of the [salmon's] migratory decision." To study salmon navigation, Putman and his colleagues took advantage of a serendipitous natural experiment. Near the mouth of British Columbia’s Fraser River is 460-kilometer-long Vancouver Island. Salmon returning from sea and aiming for the river face a choice: swim north around the island, or go around to the south. Putman pored over 56 years of data from federal fishery scientists who tracked salmon in both waterways, then matched that up with measurements of the Earth’s geomagnetic field, which shifts predictably in strength and orientation over time. He found that fish tended to choose the path where the field strength was more similar to that of the river mouth when they’d left, two years before. “The magnetic field at each route predicts the proportion coming in,” Putman said. He speculates that reaching saltwater triggers the fish to remember the magnetic field at the river’s mouth when they first head to sea — and then seek that same field on the return journey. Scientists hope the finding will help solve the mystery of how salmon find their way home from thousands of miles away, across an ocean with no lanes or landmarks. It’s already accepted that in the final stages of the journey to their breeding grounds, salmon use odors to guide them back to the stream or inlet where they hatched. But how the fish find their target river is still a mystery, although scientists have suspected for a while that magnetic cues play a role. Last summer, a team reported that rotating magnetite crystals in a fish nose responded to magnetic field orientation, providing a possible biological mechanism for this sensory capability. 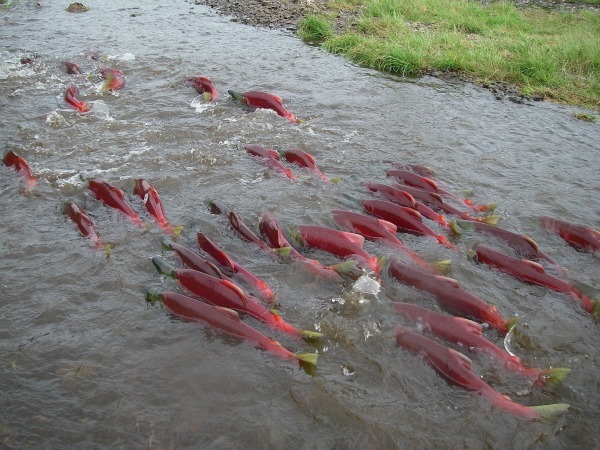 Sockeye Salmon from Fraser River in British Columbia typically spend two to four years at sea, feeding on zooplankton. Credit: Current Biology, Putman et al. “In general, we know much less about how salmon complete the ocean part of their migration compared to fresh water,” said quantitative ecologist Chloe Bracis, a graduate student at the University of Washington who also studies geomagnetic salmon navigation. Putman now hopes to investigate this correlation in experiments with captive fish subjected to artificial magnetic fields. But even if those experiments bolster the case that salmon use geomagnetic cues, these cues can’t be the whole story. The new study also revealed that sea surface temperature is an important guide for the fish — but even the interaction of water temperature and magnetic cues can’t explain all of the fishes’ knack for navigation. Temperature, olfaction and magnetoreception, while clearly important, may be just some of the tools salmon use to find their way home. “They might use … a sun compass or other cues,” Bracis said. 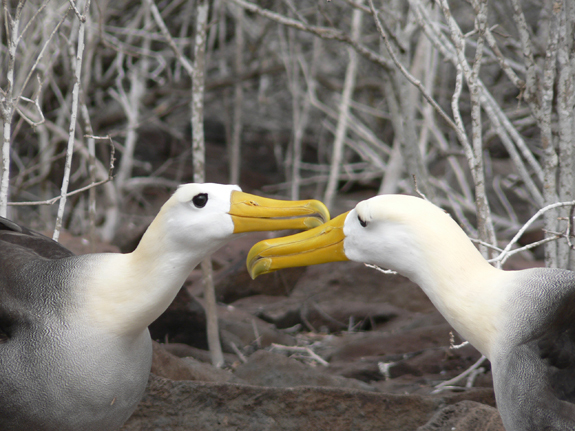 Two waved albatrosses, the only tropical albatross species, courting one another on the Galapagos Islands. We often hear stories of animal love—tales of rare monogamy in the animal kingdom where life-long love is implied. But there is a distinction between romantic love and an efficient mating system. Here’s a look at some ocean animals to see what is really going on. Albatross relationships seem especially relatable to humans. These long-lived and highly-endangered birds will court each other through ritual dances for years. Albatrosses are slow to reach sexual maturity, and some species even delay breeding for several years to learn specific mating rituals and to pick the perfect partner. The courtship behavior slows down once the pair bonds (an all too familiar aspect of human relationships). Once a pair is comfortable and breeding commences, they will return to each other and the same spot each year; for most albatross species, the bond lasts their entire life. The biological reality is that albatrosses only lay a single egg a year. With both parents fully invested in chick survival, their genetic heritage is most likely to survive. It may seem like love, but with those low reproduction rates no parents can afford to be deadbeats. 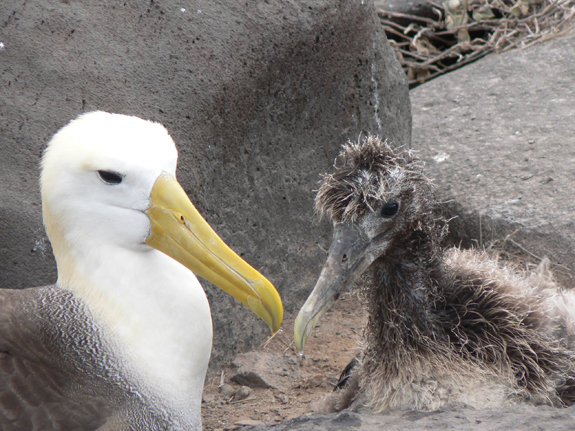 A waved albatross looks after its chick on the Galapagos Islands. If albatross relationships are reminiscent of fairytale romance, seahorses might be considered the swingers of the sea. Many seahorse species will bond with a mate, but that bond often lasts only through a single breeding season or until a more attractive female comes along. But, monogamy in this case is useful since it can be hard to find fellow seahorses due to poor swimming skills and low densities. There is evidence that the longer that partners are together, the more successful at breeding they become and the two are able to produce more offspring per brood. One species of seahorse does appear to stick with a single mate for life: the Australian Hippocampus whitei. 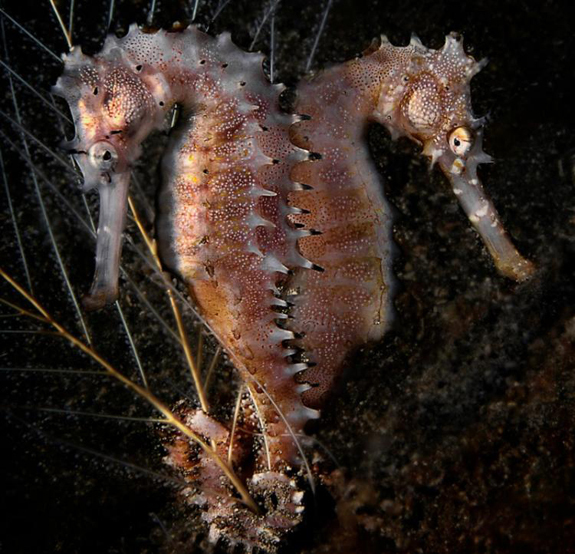 Two thorny seahorses (Hippocampus histrix), tails intertwined. Typically in pairs, French angelfish (Pomacanthus paru) help each other defend their territory against other fish. The couples have been observed spending extended periods of time together, exhibiting more of a monogamous social structure. Genetic monogamy (i.e. testing fertilized eggs to confirm they come from a single father) hasn’t been confirmed, but there have been observations of pairs traveling to the water’s surface to release their eggs and sperm together. Monogamy is not that common in fishes, and it is mostly found in tropical and subtropical waters. Care needed from two parents, joint defense of territories, and difficulties in finding a mate all can play a role. 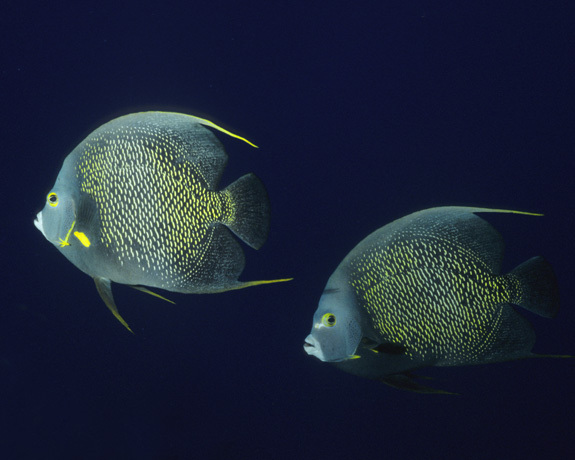 A pair of French angelfish off the coast of Brazil. These intriguing glass sponges, called Venus’s flower-baskets (Eupectella aspergillum), are made of flexible silica that can better transmit light than our man-made fiber-optic cables. And many of these beautiful deep-sea sponges are also home to a monogamous pair of shrimp. Several species of shrimp find refuge in these sponges, but due to the limited space found within the fine-mesh silica, only two adult shrimp can fit inside—and they are stuck there for life. The two spend their days cleaning the sponge and eating whatever bits of food manage to flow through. After they breed, their small offspring can squeeze through the holes in the mesh to escape, but eventually they will settle into a new home with their own imprisoned mate. 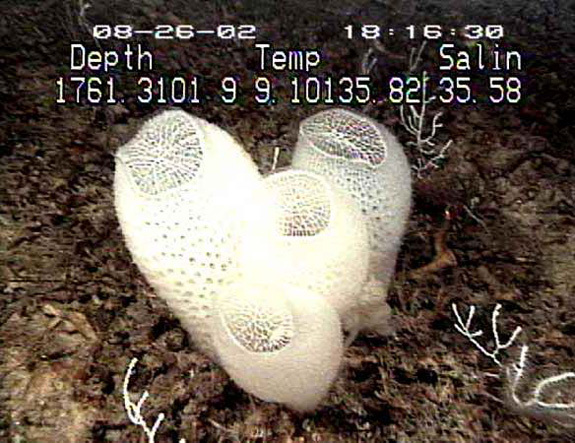 The silica home of a male and female shrimp – the deep-sea sponge Venus’s flower-basket. The gift of this sponge, taken from the deep with the two dead shrimp still trapped inside, is considered good luck for couples marrying in Japan. It seems as though young human couples are not the only ones to share tight living spaces. 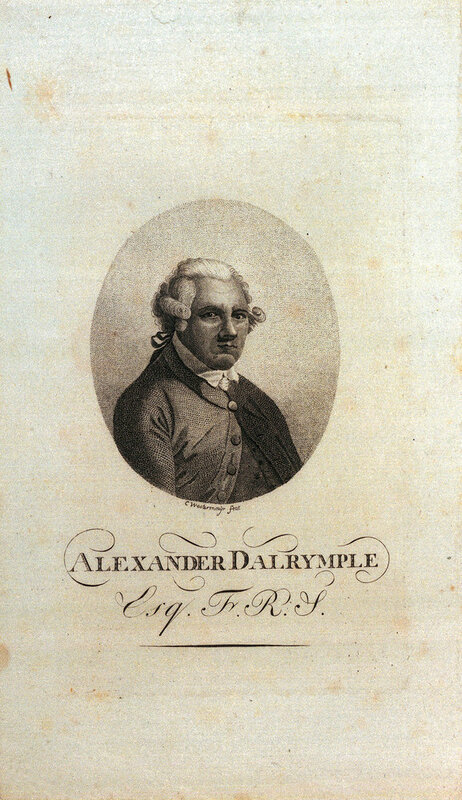 Alexander Dalrymple was an extraordinary fellow, even for a son of the Scottish Enlightenment. He was a secretary, navigator, hydrographer, trade economist, political pamphleteer, author and collector of songs and poetry. He drew hundreds of charts for the East India Company and the Royal Navy. He helped establish the Beaufort scale to measure wind speed. And he was the first westerner to predict the existence of a great southern continent. The painting is dated to about 1765 and is the only known likeness of Dalrymple in the UK. He was one of those restless Scots who helped build the British Empire in the 18th century. And he is remembered to this day as the founder, in 1795, of the UK Hydrographic Office, which produces the famous Admiralty Charts – the 3,300 maps which cover the world’s oceans, shipping lanes, ports and harbours. The latest Alexander Dalrymple Award was presented last year to Dr Hideo Nishida of the Japanese coastguard for his work on tsunamis and his agency’s response to the major tsunami which struck north-eastern Japan in March 2011. It must be said that Dalrymple was not an easy man to work with. He was argumentative, independent-minded, head-strong, arrogant, often insulting. His later portraits make him look like an angry bull. He was sacked three times by various employers and his doctor declared that he “died of vexation.” But he made the world’s seas a safer place and he opened new trade routes which brought riches – if not to himself – then to his country and the global economy. Alexander Dalrymple was born at Newhailes House near Musselburgh on 24th July 1737, the seventh of 16 children. His oldest brother was Lord Hailes (right), the judge and historian, who was a leading light of the Scottish Enlightenment. The family could not afford to send Alexander to Eton like his older brother and he even had to leave the local school in Haddington when his father died. His brother tried to educate him at home but already there were signs of rebellion. He was sent to a secretarial school in London but again things did not go particularly well. Eventually his uncle, General St Clair, managed to get him a job with the East India Company and at the age of 15 he found himself posted to Madras. He began as an under-storekeeper, but the Governor, Lord Pigot, saw the boy’s potential and moved him into the secretarial office, even giving him lessons in writing and arranging for him to learn accounting. But the quiet life of a company clerk was not enough for Alexander. He thought the company was not taking full advantage of the trading possibilities in south-east Asia. He resigned his post and managed to wangle his way onto a ship to China and Borneo where he negotiated his own trade agreement with the Sultan of Sulu. But when his vessel arrived to begin trading and take on its cargo, he found that small-pox had killed off many of the merchants involved and the Sultan’s politics had suddenly changed. Dalrymple returned to London in 1765 a disappointed man, but also a knowledgeable one. He had learnt a lot about the geography of the Far East. It might, argued Dalrymple, contain a population as big as China or India and be a goldmine for trade. It used to be thought that the first Admiralty chart was issued in May 1801. The recent discovery of this sheet, however, pushes back the beginning of Admiralty chart publishing to at least November of the preceding year. 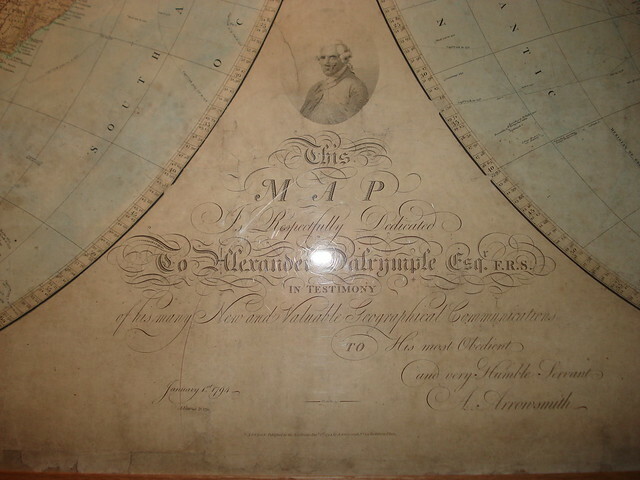 Admiralty charts issued up to the end of Alexander Dalrymple's tenure as Hydrographer to the Admiralty in 1808 look very much like the charts which Dalrymple published at the same time in his capacity as Hydrographer to the East India Company, and the two can easily be confused. (By courtesy of Lieutenant Commander Andrew David RN). While in London he also wrote a book, Practical Navigation, in which he argued the case for a standard measurement for wind speed to help navigators compare conditions at sea. It was an idea first proposed by the civil engineer John Smeaton, who was working at the time on windmills. But it was Dalrymple who brought it to the attention of Francis Beaufort who went on to develop the famous Beaufort Scale. The young Dalrymple – he was only 30 years old – so impressed the scientific community in London that he was elected to be a fellow of the Royal Society, with famous names like Benjamin Franklin on his nomination papers. He was even considered for the Society’s expedition to Tahiti to observe the transit of Venus in 1769. But because he insisted on commanding the expedition himself , he was passed over in favour of Captain James Cook and the scientist Joseph Banks. Cook and Banks however drew heavily on Dalrymple’s book and when they opened their secret orders in Tahiti, they went on to “discover” the great southern continent he had predicted. They sailed right round New Zealand and then landed in Australia in April 1770, claiming it for the British Crown. We now know of course that some 50 western ships had visited Australia before Cook – the earliest, a Dutch expedition in 1606 – and no one knew just how big the island was or that it already contained 250 aboriginal tribes. Back in London, Dalrymple continued to insist that a large continent remained undiscovered – the famed Terra Australis Incognita. Somewhat in a huff, he went off again to the Far East and found that his mentor Lord Pigot was prepared to have him back in the East India Company as its official hydrographer. He produced hundreds of detailed charts of the seas and ports – arguing with anyone and everyone over the names of obscure islands and again proposing new trade links with various kings and potentates. He was passed over for promotion, sacked and taken back on again, in a turbulent career with the company. He wrote intemperate articles about missed opportunities for trade. In one, he opposed the establishment of a penal colony at Botany Bay, calling it a “mad scheme” which would undercut the East India Company’s business in South-East Asia. He thought prisoners should be sent to Tristan da Cunha instead. Ironically, his great rival, Captain Cook, meanwhile set out on a second expedition, in 1772, to find the Terra Australis Incognita. But he turned back at 70 degrees south, just as he was about to run into Antarctica, the real southern continent. That remained undiscovered for another 45 years. Alexander Dalrymple was not around to see it, of course. But he spent the last few years of his life in his most important job, the first official hydrographer for the Royal Navy. From 1795 until his death 13 years later, in 1808, he worked on producing a comprehensive set of charts for the Admiralty of the world’s most important ports and seas. But he also found time to produce a stream of articles on current affairs – the American war, the currency, the state of shipping, the North American fur trade, the wickedness of the Spanish colonists and, of course, various commentaries on the state of the East India Company. He also wrote a history of the industries of the Far East. By the end of May 1808, the Admiralty was trying to persuade an ever more cantankerous Dalrymple to retire. He refused to do so and was promptly sacked. He died less than a month later. The edge of the Great Whirl, shown by high chlorophyll concentrations along its flank. One of the ocean's weirdest currents is the Great Whirl, a giant clockwise eddy that emerges every summer off the coast of Somalia. The swirling waters shift sea-surface temperatures, influencing moisture carried to Asia by monsoon winds. For more than 100 years, sailors have known the Great Whirl arrived with the onset of monsoon winds in early June and disappeared about one month after the winds died down in August. Monsoon winds are some of the strongest on the planet, blowing at a constant 30 mph (48 km/h). Because the massive vortex has a powerful impact on local climate, including the monsoon winds, scientists are studying how and why the Great Whirl appears. It turns out the Great Whirl is even more closely linked to the monsoon than previously thought, but through the ocean, not through the atmosphere. A new study reveals the clockwise current spins up nearly two months before the winds arrive. "[Oceanic] Rossby waves are bringing in energy well before the wind forcing sets in," said Lisa Beal, an oceanographer at the University of Miami in Florida. "We've got this precursor even before the monsoon hits it. That was rather surprising," she told OurAmazingPlanet. The results were published online the week of Jan. 28 in the Journal of Geophysical Research. The Great Whirl is a humongous anti-cyclone: 185 miles (300 kilometers) across and about 3,280 feet (1,000 meters) deep. Its waters move clockwise, with the surface current (the fastest part) clipping along at a speedy 4.5 mph (7 km/h). The annual arrival of oceanic Rossby waves in April triggers the clockwise circulation, nearly two months before the monsoon winds start, found Beal and co-author Kathleen Donahue of the University of Rhode Island. Rossby waves are slow-moving ocean waves, only 2 inches (5 cm) high, that travel from east to west. 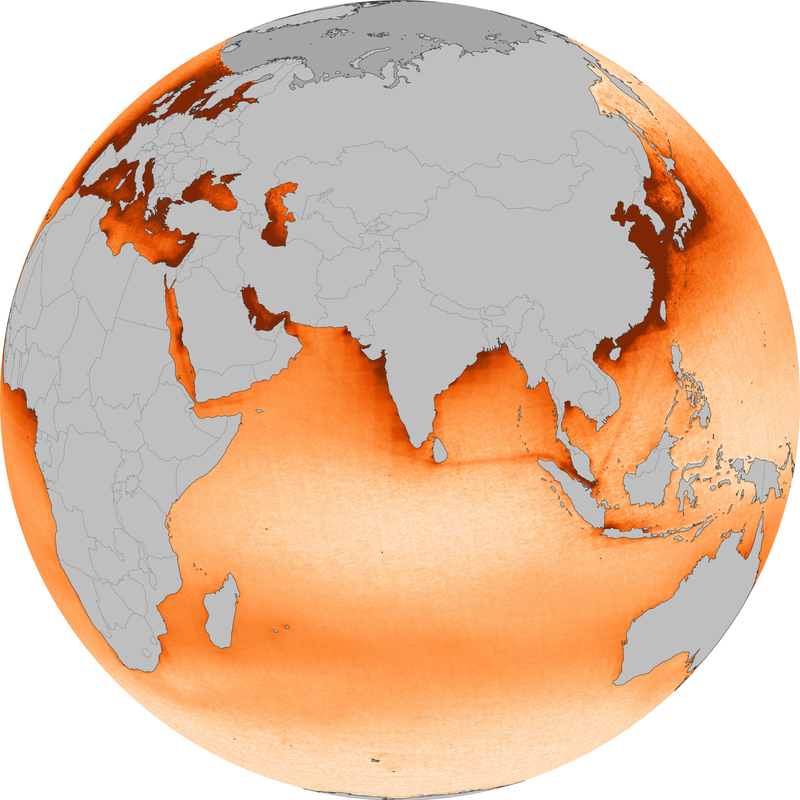 In the Indian Ocean, these waves are linked to the previous year's monsoon, Beal said. "The waves themselves are disturbances caused by the previous monsoon winds, which is really neat. It's kind of a feedback from one monsoon to the next via these planetary wave processes," Beal said. However, the current relies on the monsoon winds for its power. "The monsoon winds don't initiate it, but it wouldn't be there if there wasn't monsoon winds," she said. The researchers analyzed the Great Whirl's habits by combining 18 years of satellite records with data collected from a research cruise in 1995. There have been very few research cruises through the Arabian Sea since 1995 because of Somali piracy, Beal said. The vortex lasts for roughly 166 days each year, but the team found no predictable pattern to its location and orientation. Over the years, the Great Whirl's wanderings were caused by its own mini-cyclones, the researchers discovered. As the current spins, it creates two to three flanking cyclones along its edge. The interaction between the smaller cyclones and the "mother current" makes the Great Whirl move and shift around in response. "The Great Whirls spins up these flanking cyclones because it has such high velocity shear along its edge. The water is basically rotating these cyclones clockwise around its flank, and it's causing a kind of turbulence. It's like a mutual eddy advection," Beal said. The Great Whirl is not the only strange phenomenon in the Arabian Sea. The basin is the only place in the world where the ocean's currents reverse direction every year. "The entire circulation of the basin switches direction from summer to winter, which is really crazy. It doesn't happen anywhere else in the world's oceans," Beal said. Understanding how the region's currents respond to the monsoon winds is important because the circulation is directly linked to sea surface temperature, Beal said. As with the Pacific Ocean's El Niño, sea surface temperature is the No. 1 effect on rainfall, she said. Because the Great Whirl brings up warm water in its core, but cold water in its smaller flanking cyclones, the current has a complex effect on climate and moisture content in the monsoon winds. Beal plans to further explore the link between the Great Whirl and Rossby waves. "If there is some feedback between the previous monsoon and how the Great Whirl is initiated, that could give us some predictability on what the strength of the monsoon will be, and also some predictability about the rainfall, which will be important to people who live in southern Asia." The oceans are changing faster today and in more ways than at any time in human history. Which is why I welcome the launch of the Global Ocean Commission, dedicated to ending the neglect, in international affairs, of the high seas. These seas lie far beyond the horizon – 200 nautical miles offshore to be precise – and begin where sovereign national waters give way to the global commons, owned by none, shared by all. There was a time when foreign travel gave many people a familiarity with the high seas. Rather than a few hours in a plane, "long haul" often meant days or weeks spent staring at an endless canvas of sea and sky. Today, few of us know much about what happens beyond the horizon and still fewer care. Like all common spaces, the high seas are vulnerable to misuse and abuse. Our indifference is costing the world dear for the high seas are being plundered. For most of our maritime history, the open oceans have been seen as dangerous places to be traversed as quickly as possible. Remote and enduring, they were home to giant fish and whales; seabirds wandered their featureless expanses and ancient corals grew in the eternal darkness of the abyss. Despite an increased awareness of overfishing, the majority of people still know very little about the scale of the destruction being wrought on the oceans. This film presents an unquestionable case for why overfishing needs to end and shows that there is still an opportunity for change. Whalers were first to spot the high seas' potential as a source of wealth, slaughtering their way through the 19th and 20th centuries until the great whales were a few breaths from extinction. Ocean-going seabirds such as albatross and petrels were also early victims of exploitation due to the vulnerability of coastal nesting sites. But commercial fishing was a relative latecomer. Fishing began in earnest in the 1950s as long-line and drift-net fleets sought profit in open ocean species such as tuna, swordfish, marlin and shark. By the 1980s, they were everywhere. The huge collateral damage done by these fisheries soon caused alarm. Drift nets spread lethal curtains tens of miles long killing indiscriminately, taking turtles, whales and dolphins alongside the target fish. They were banned by the UN in 1992 but long lines studded with tens of thousands of hooks continue the massacre. Enough long lines are set every night to wrap around the globe 500 times. In a separate development, from the 1960s, Soviet and European vessels began to probe deeper in response to the decline of their shallow water fish stocks. They found riches on the Atlantic frontier, where continental shelves fall away into the deep, and around the summits of submerged offshore mountains. But these fisheries have proved highly vulnerable to overexploitation. Within the space of a few decades, species such as the roundnose grenadier and orange roughy have become so depleted they are considered threatened with extinction. Deep sea fisheries carry another high cost in loss of coral forests and sponge groves. Life is glacial in the frigid inkiness of the deep, so these habitats have developed over thousands of years, sustained by table scraps sinking from a narrow surface layer where sunlight fuels plant growth. The bottom trawls that are used to catch fish cut down animals that are hundreds or even thousands of years old. Without ever making a conscious decision to do it, we are losing unseen habitats whose equals on land would include the giant redwood glades of North America, the baobabs of Madagascar and Amazon rainforest. Where are the regulators in all of this? Many high seas fisheries have little or no protection. Regional fisheries management organisations, where they exist, have been charged by the United Nations with management of fish stocks such as tuna. 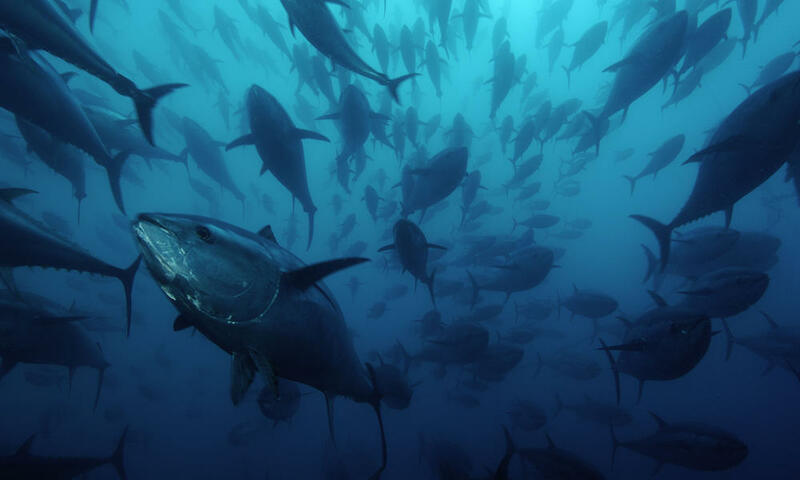 The best of them are sleeping on the job; the worst, as with the "management" of the endangered Atlantic bluefin tuna, make decisions in the full knowledge that what they are doing is destroying what they are supposed to protect. Fishing is not the only problem. Remote as they seem, the high seas are no further than anywhere else from the inescapable influence of climate change, nor are they beyond the reach of pollution. Mercury and industrial emissions from power plants and industry shed their toxic loads far out to sea. Chemicals concentrate in the surface layer that separates air from water and can quickly leapfrog across thousands of miles of ocean in wind-whipped aerosols. Circulating currents gather the floating refuse of modern society into enormous regions that have been dubbed the "great ocean garbage patches". Over the years, drifting plastics fragment into ever-smaller particles that pick up and concentrate chemical pollutants such as mercury and DDT. Small fish mistake plastics for food and pass chemicals up the food chain until they reach the flesh of animals we eat, like tuna and sharks. promoting general awareness of the science of climate change. If this were all we had to fix, it would be challenge enough. Climate change is enlarging the deserts of the sea as surely as it is doing so on land. Surface waters of the open ocean have all the light but few nutrients, which severely limits productivity. Most of the time, upward mixing of nutrients is inhibited by a density barrier between the warm and light surface layer and cold, dense water below. Global warming is heating the surface ocean, making it even harder to cross between these layers. This in turn is starving deeper waters of oxygen that has to mix downwards from the atmosphere and surface plants. The living space in the oceans is shrinking. Ever wondered what impacts all that carbon dioxide we emit is having on the ocean and what consequences this could have for the future? This Google Earth Tour, narrated by Dan Laffoley from the International Union for Conservation of Nature (IUCN), who is Chair of Europe's Ocean Acidification Reference User Group, takes us on a global journey to understand what impact carbon dioxide has on ocean chemistry. It explores the phenomenon of ocean acidification and explains why even small changes to ocean chemistry could have profound implications for marine life and future economic activities. There is one final blow to the integrity of the oceans that may yet prove the heaviest of all. Carbon dioxide from fossil fuels is building up in the sea as well as the atmosphere. There, it forms carbonic acid (as in fizzy drinks). Acid is the nemesis of carbonate, the basic ingredient of chalk and a fundamental building block of ocean life, including shellfish, corals and plankton. If we do nothing to curtail emissions, ocean acidity will soar by the century's end toward levels not experienced for 55 million years in a period of runaway global warming. It is difficult to predict the exact outcome, but let's just say that last time around, corals and chalky plankton suffered badly. We carry on today much as we have done for thousands of years, using natural resources as if they were endless. But population growth changes everything. We must get to grips with the consequences of our planetary dominance, otherwise the consequences will master us. Out of sight and out of mind they may be, but the high seas are vital to everyone. By virtue of their sheer size they play a dominant role in the processes that keep our world habitable. They are too big for us to let them fail. The Global Oceans Commission has urgent work to do. Dolphins trick fish with mud "nets"